Dan Dooley, on behalf of the Knights of Columbus Barrie Council, donated nearly 50 childrens coats to the Children’s Aid Society Barrie (Simcoe County Family Connexions) for the third year. The Knights will also be presenting coats to the Women’s and Children’s Shelter in Barrie this year. 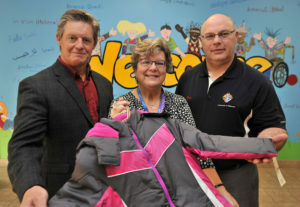 Pictured with Dan Dooley is Nancy Green from the Children’s Aid Society Barrie and Grand Knight, Paul Gamble. Thank you to everyone who contributed to the program.